Lately, I've been in a rut with my writing. Sometimes writing for me feels a bit like a bad first date and I am not able to get that connection. There's no chemistry between me and the stories I'm writing lately. It's official folks - I'm in a writing rut. Have you ever been there? Confession, 90% of my reading lately is books I've committed to review. When I have a window where I'm reading books I've chosen, I tend to go for my usual genre choices of mysteries, thrillers, and young adult science fiction. However, if you find yourself in a rut like me, choose a different genre than what you might normally read. Love romances? Pick a mystery. Love a good horror novel? Pick up a non-fiction memoir. Exposing yourself to different types of storytelling can trigger your own creative impulse and get the juices flowing. 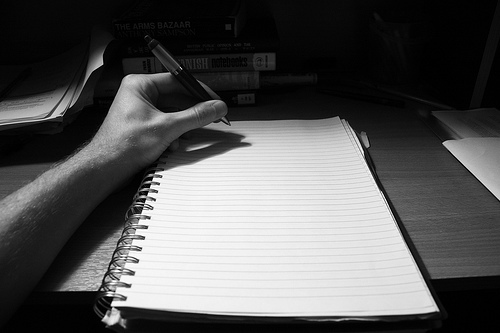 Most of us have a writing schedule, or at least a time of the day we tend to write best (or it's simply the most convenient, ever so brief window in our day). For me, it's usually the evenings after dinner. Yet, that isn't working anymore. Lately, I've decided to write differently. I plan on committing to writing short bursts during my day, at least 15 minutes at a time. I have tried this in the past and it ends up being incredibly productive, far more productive than writing at night (which ends up resulting in me zoning out with a pen in my hand). Sometimes when I write a story, I don't plan to write something so only I could see it. I like to write in hopes that this story will evolve into something I will get published and will be read by others to enjoy. However, lately that results in the story going off into a ditch. My best stories have come about when the idea feels like an itch needing to be scratched. It didn't even matter if I only wrote it once and never went back to it. I HAD to write it. I had to see what happened. If you are in a writing rut, write a story for one reader and one reader alone - you. Write it believing the public eye will never read a single word. Unleash your inner creative weirdo. 4) Frankenstein your story snippets. Am I the only one with a lot of partially finished work? I tend to get scenes in my head, characters that stand out, and plot lines that can't quite latch on that hang in a creative abyss. If you are in a rut like me, that doesn't lead to a successful feeling. So, pick up two different incomplete works and fuse them together. Even if it's a completely different plot line. Forget about how weird it is and stitch it together like a patchwork quilt. What would happen if your murder mystery dumped itself into your 1940's romance? What if your two characters on a road trip bumped into the bank robbery happening for another set of characters? Try this out and see how you can weave a completely new story. The Nike slogan says it best, "Just do it." Sometimes the best thing to do when you are in a rut is to flex that discipline muscle and power through it. It isn't easy, but sometimes that can be the only solution. Have other tips for getting out of a rut? Share them in the comments or let me know on Twitter (@BeingTheWriter). Embrace your writing weirdness, Nicole! :) I love these ideas. A lot of writers do 15 minute bursts throughout the day. I've never tried it, but I feel like I'm just starting to get warmed up after fifteen minutes. An hour a day is better for me. I always write for me, which is also one of my problems because then I can't get the nerve to submit because it's so personal. That's one of my goals this year though...learning to not hold back and just go for it. Oh I'm the same way! I'm so afraid of submitting a story but this year I would love to get over that hurdle!